I remember reading the very first Spooks book a number of years ago and really enjoying it. Never having been sent any to review until since I've had little opportunity to read any others in the now quite size-able series (13 volumes at the time of writing). It's clear I should have read more Delaney than I have, not least due to the fact the series is set around my home town of Lancaster and the county of Lancashire. This novel even features the area I work (Kirby Lonsdale). Delaney lives somewhere nearby and went to school at the same place as my Brother and talented author Joe Abercrombie (Lancaster Grammar School, one of the oldest Schools in the country). A New Darkness is the start of a new series, one that does seem to follow on from previous events in the Spooks universe. There are a number of references to characters and past events that fans of the series will pick up on however the book has enough details for the new reader to just enjoy the well crafted story. It does however occasionally make you feel like an outsider who doesn't get the in-joke but you get that anytime you pick up a book that is following a long history of events you haven't encountered. 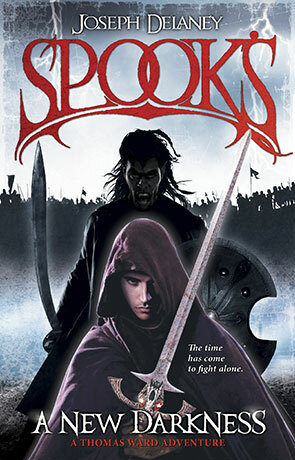 The novel follows Tom Ward, the Seventh Son of a Seventh son and "Spook" for the Chipenden (Lancashire) area. Essentially he's a warder who must deal with any ghosts and witches along with creatures such as boggarts and ghasts or anything else that is supernatural and unkind to the living. He also happens to be the son of Lamia - the mother of all Witches and as such has some fairly unique abilities. As you might expect from a YA book, A New Darkness is written in an uncluttered and easy-reading style that is immediately disarming. After 13 books, Delaney has clearly mastered his talents and the quality of the writing is superb. Simple without being condescending, tense when it needs to be and as descriptive as you would want a Young Adult to read without descending into too much death and disaster. More than that though the story is genuinely entertaining and less predictable than many, the characters are well drawn and the canvas described in enough detail without descending into lengthy exposition. The cliff-hanger ending is worth reading for alone. A New Darkness is a confident and entertaining novel, a quick easy read and one that makes you want more at the end. Spooks Fan or newby alike, most should enjoy this book (even more so if you've visited Lancashire). Written on 3rd April 2015 by Ant.